Quocirca research shows that UK business are rolling out new Internet of Things (IoT) applications to exploit diverse new business opportunities. This includes deploying new devices and integrating existing ones. However, the burgeoning number of network attached devices introduces new risk. How can the IoT opportunity be embraced securely? 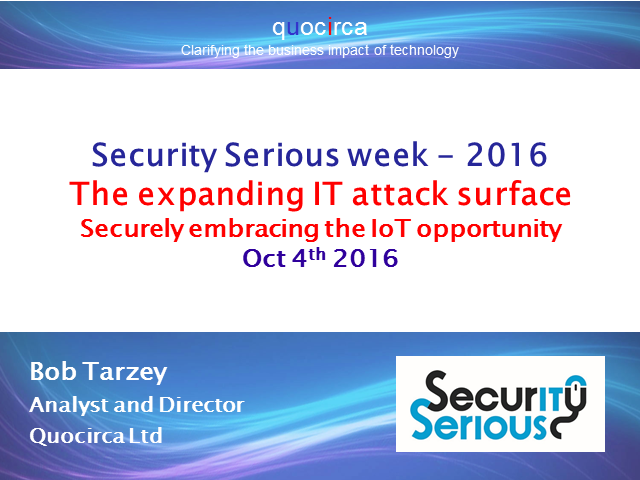 Bob Tarzey, Analyst and Director, Quocirca Ltd. Presented by: Bob Tarzey, Analyst and Director, Quocirca Ltd.